New York City—On Friday, June 12, TRIP was honored to provide underwriting for a dynamic conversation between artists, curators, nonprofit leaders and executives of city, state and national park systems on the future of art in public parks, organized by Creative Time, a New York City-based cultural organization that produces historic public art projects. Participants included senior staff and representatives from the National Park Foundation, New York City Department of Parks and Recreation, Madison Square Park, Friends of the Highline, Socrates Sculpture Park, The Metropolitan Museum of Art, Freshkills Park, Queens’s Museum, Queensway and The Trust Public Land, among others. 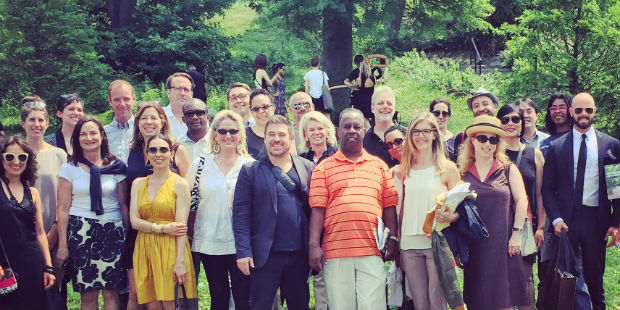 In total, 30 cultural and civic leaders gathered in Harlem to discuss how artists are activating parks and engaging new, diverse audience—the goal of this generation. Anne Pasternak, Creative Time President and Artistic Director, led the conversation. Nato Thompson, Chief Curator of Creative Time, discussed the challenges of producing new progressive forms of public art in parks. The Future of Art in Parks discussion was inspired by and held in conjunction with Creative Time’s free summer exhibition Drifting in Daylight, a pathway of contemporary art in Central Park that drew 100,000 visitors into the park’s restored north end. Drifting in Daylight was the first large-scale exhibition in Central Park since 2004 and nearly 25 years since a public art project has been produced in the frequently overlooked section of the city park, an area surrounded by some of New York City’s most diverse and culturally rich neighborhoods and home to many economically marginalized families. The park receives 40 million visitors annually. TRIP’s sponsorship supported Creative Time’s ability to do community outreach, engagement with local schools, as well as roundtable discussions, salons, and picnics. The importance of partnership and collaboration between cultural organizations, artists, local government, and advocates for public parks arose as a central theme during the morning conversation. The critical need for parks’ inclusion and service to all communities through such innovative partnerships was also raised by several of the participants. TRIP provides support to Creative Time in an effort to help the organization produce such seminal projects, from artist Nick Cave’s transformation of Grand Central Terminal’s Vanderbilt Hall to Kara Walker’s A Subtlety, inside the industrial relics of Brooklyn’s historic Domino Sugar Factory and to support Creative Time’s outreach on the global arts stage. For more information about the organization, please visit creativetime.org.